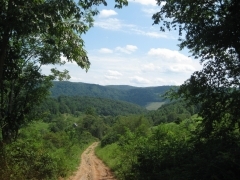 White Creek Acres is a gated community located along the rolling hills of the Cumberland Plateau. This 5.75 acre tract has over 100 feet of road frontage at the end of a road that ends in a cul-de-sac. A small area has been cleared along the road, while the remainder of the property remains wooded and ready for your creative touch. The creek frontage along the back of the property provides tranquility, while the Scenic Trail provides access to other areas that would otherwise be unavailable. The Scenic Trail Easement can be entered from either the northern or the southern entrance, however this property provides access directly. Horses were excluded from the livestock restrictions, providing you the ability to take in the gorgeous scenery while horseback riding alongside the creek. An Architectural Review Committee is standing by to approve your 1,000 square foot or larger home design. You expect the value of your property to remain high, and the Property Owners Association will help to maintain that value by holding each of your neighbors to the same minimum standards. Access to electricity and water has been provided by the local utility companies. Property restrictions can be viewed here. The red line highlights the scenic trail easement that gets you hiking access along the creek frontage.